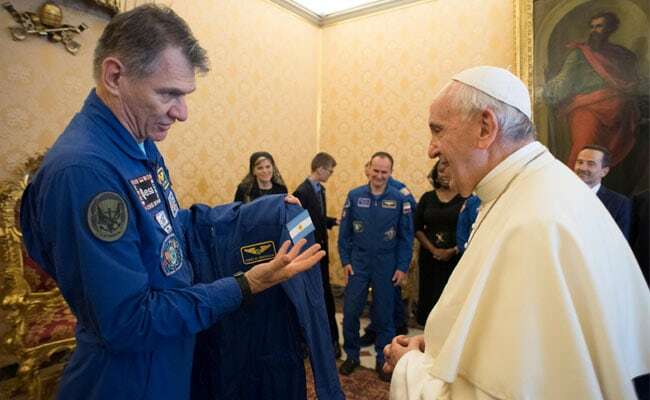 "Since clothes make the man, we thought we'd have a flight suit like ours made for you," Italian astronaut Paolo Nespoli told the pope at a meeting in the Vatican also attended by four other Space Station veterans - three Americans and one Russian. VATICAN CITY: Astronauts from the International Space Station gave Pope Francis his own blue jump suit on Friday but to distinguish him from ordinary planetary pilgrims like themselves they added a white cape. "OK, and you will plan my trip," joked the 81-year-old pontiff, clearly enjoying the exchange. Nespoli said the suit was identical to theirs and made of the same material. It bore the pope's name at birth, Jorge Bergoglio, and the flag of his native country, Argentina. "Then we decided that the outfit was good, but, since you are the Holy Father and the Holy Father has his own uniform, we made a cape," the Italian astronaut added. The small white cape bore the Vatican flag, the official NASA wings logo and "Pope Francis" embroidered on it. Nespoli was one of the astronauts who were aboard the Space Station last year when the pope had a 20-minute video call with them from the Vatican. In that conversation, he told them that the Earth is a fragile thing that could even destroy itself and that they were privileged to be able to see the planet "from the eyes of God".